Joe Sacco often works on the shifting edges of civil society, observing and recording and reporting on the lives of those who live under conditions that most of us could never imagine, much less imagine surviving for any appreciable period. 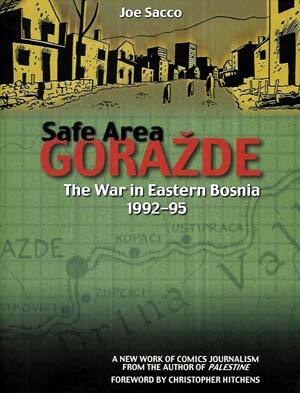 From the long-lived and then recently re-ignited hotbeds of political and civil unrest that envelope whole regions or nations in the Mid East or Europe [as demonstrated in Sacco's award-winning Palestine and simply brilliant Safe Area Gorazde, respectively], to his examination of the road life of one of the last living real bluesmen for the New Yorker, and his more recent work like The Fixer, Sacco doesn't just describe or portray his subjects and their experiences with a dispassionate eye or voice. Rather, he digs deep by interviewing, and often living with, his subjects as he tries to come to grips with how and why they manage to live the way they do under the impossible conditions and severe restrictions that encompass their lives, and how and why they came to be what they are, where they are. All of his books--even his early, non-journalistic work like War Junkie--provide an entertaining reading experience that is by turns informative, funny, moving, terrifying, heartbreaking, heartening, and ultimately equal parts affective as effective in broadening the reader's basic grasp of at least a part, however small, of a quite larger and very deadly puzzle. A true pioneer, Sacco is one of a handful of people who are creating a new form of comics. Whether you call it nonfiction graphic narrative, or reality comics, the fact remains that it's an important development in the art form, and Sacco is one of the major innovators in the field, literally and figuratively. Bill Baker: What term or phrase do you use to describe what you do? 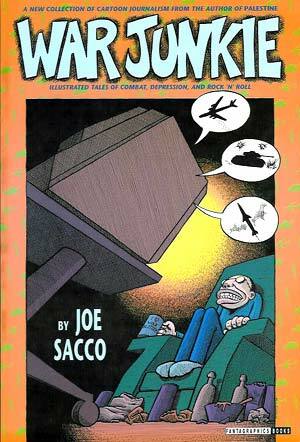 Joe Sacco: Well, I use the phrase "Comics Journalism" or "Cartoon Journalism". I don't really see any distinction, except maybe"comics" I figure it's a longer piece, and a "cartoon" it could be something in a magazine. But I think Comic Book Journalism. In other words, a long piece that's done journalistically. And, from my point of view -- 'cause there might be other interpretations of this -- but from my point of view, that's a very straight forward thing. In other words, there is real journalism involved. It involves standard journalistic practices, like interviewing, going to a scene and trying to cull information, and taking notes, things like that. So, I just try to convert that into comics form as best I can, because I'm a cartoonist. You know, I studied journalism, as I told you, and those are my two loves: cartooning and journalism. So I'm just putting the two disciplines together. BB: How did you get involved in journalism and cartooning, and how did you figure out -- or is there a program that showed you how -- to meld the two together? Sacco: Not really. I've been cartooning since I was a kid. This was always something I did as a means of self expression. And also, when I was in high school, I learned I like to write quite a bit. And I went through the journalism program in high school, was editor of the school newspaper, and then decided I would study journalism, because I loved it so much. After graduating from journalism school, I was quite disappointed with the sort of jobs I was getting. They didn't seem to fulfill any idea I had of what journalism was about, to say the least. And so, in my off hours, I spent time sort of reverted back to doing comics just for fun, for myself. And, as I said, comics was something I'd been doing throughout the years, so it wasn't something I dropped for any length of time. Eventually, I decided I would hang my hat on comics, because that was much more satisfying. And I was doing satirical and humor comics, but I was always interested in the world, what was going on. And the Middle East began to interest me quite a bit, to the point that I felt compelled to go and have a look for myself. And I didn't want to go just as a tourist, or just go and see something, and then that was the end of it. I figured what I would try to do is actually do some reporting. But since I was already involved in the comics world, what I thought I would just put my reporting into comics form. So it just came out of this organic desire to go to the Middle East and, ya know, have a reason to go. Get something out of it, in other words. I never had some big theory of what comics and journalism was, or how they could be put together. It was just something that [seemed natural], "Well, I'm a cartoonist, why shouldn't I be able to do something like this? Why shouldn't I just report, and tell people stories graphically?" So that's kinda how it started; for me, anyway. BB: Have you gotten to the point where you have a system when you create the work? I mean, you must have come up with some techniques on your own, and adapted, or even jury-rigged other methods learned during your training, to do the work. Sacco: Well, I don't think I have a systematic approach. I mean, my approach in the field is systematic, in that I know what I have to do, and I know it's a tremendous amount of work. You constantly have to have your ears and eyes open, and you have to be just ready to go all the time. There were times I was very tired [while in Bosnia], and I thought, "Well, I should go to this party," or, "I should go to the rock club now," because I figured I might meet someone, ya know, that might tell me an interesting story. I just pushed myself quite a bit. So, I've a very professional journalistic sensibility when I'm in a place like the former Yugoslavia, or the Middle East. But as far as when I get back, how I organize things, that's sort of a more organic process. 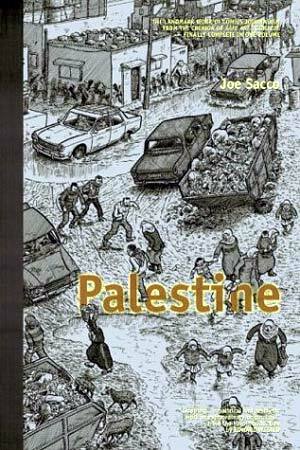 I mean, I think Palestine is written one way, as a very sort of free-flowing narrative, whereas the book on Gorazde is much tighter. It's much more controlled. And I don't know exactly where I'll go next time, or how my format will change, next time. That's just something I'll find out. I mean, you learn as you go along, too. I look back on certain things, and think, "Well, this could have been better here, or there." It's a learning process at this point.